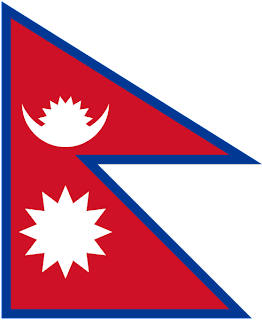 Nepal has the only non-quadrilateral flag in shape, in the world. Throughout its history, Nepal has remained fiercely independent. Indeed, never really being under total control of the British Empire. Influenced, yes. A friend to the British Empire, but never a subjugated colony. The fierceness of the Nepalese so impressed the British, that they took to employing Nepalese in the British Army. Forming the Gurkha Regiment, one of the most respected, determined, and feared in the world. Flags themselves really originate in Europe, and used on ships. Hence the rectangular shape. They have since spread around the world. However, with Nepal having no coast, they kept their uniquely shaped flag. In 1928, the first recognisable flag was introduced. A double triangle red flag, bordered in blue, with a sun and moon motif located in each triangle. Each motif features a face. Another option comes from 1928, when the double triangle flag was edged with green. The flag was maintained through to 1962, when they where removed to modernise the flag. With the overthrow of the monarchy by the Maoist movement, there was a call to replace the flag of Nepal. Once such idea was to use a red banner, and place a 12 point star in the canton. Not surprisingly, given the Maoist movements communist ideals, the banner shares many similarities with flags from other communist governments. However, this idea was not accepted, with the new government choosing the keep the flag, but change the definitions of the colours. 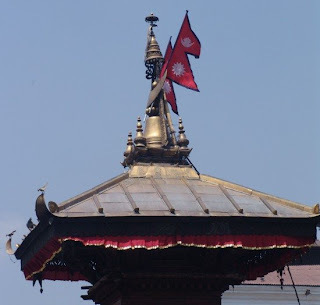 The red in the current flag is taken as the national colour of Nepal, the colour of victory, and the colour of the Nepalese national flower, the Rhododendron. The blue represents the peace and harmony that Nepal has enjoyed since ancient times (though with the Maoist uprising, that proves to be a little bit of a lie!). 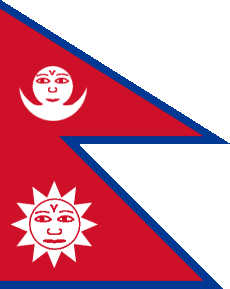 The sun represents heat, and the resolve of the Nepalese, and the moon represents coolness, and the calm of the Nepalese. The use of both the sun and the moon represents the hope that Nepal will last as long as both these celestial bodies. The shape of the flag can be interpreted in many ways. 1 is that they represent the 2 main religions in Nepal, Hinduism, and Buddhism. Another reason is that they represent the Himalaya mountain range, and another idea is that they are inspired by a Nepalese pagoda.